Today Christian Louboutin launches 38 shades of Louboutin Lip Colour in three distinct formulas ($90 each). The Lip Colours come cased in the most ornate packaging I’ve ever seen for the lipstick. The design is inspired by Babylonian architecture – it resembles an elixir vial and is capped with a stunning crown. The three different textures include a multitude of colors. 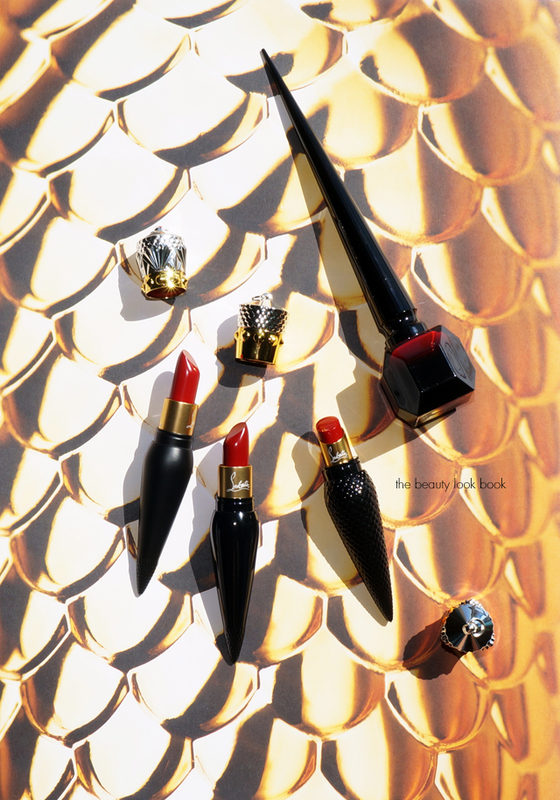 Each formula has the red classic Louboutin Rouge color. I have swatches of the three reds to share today. They come with a hefty price tag and I am pleased to report Louboutin has taken lipstick to another level, not just with the packaging, but also with an incredible formula. 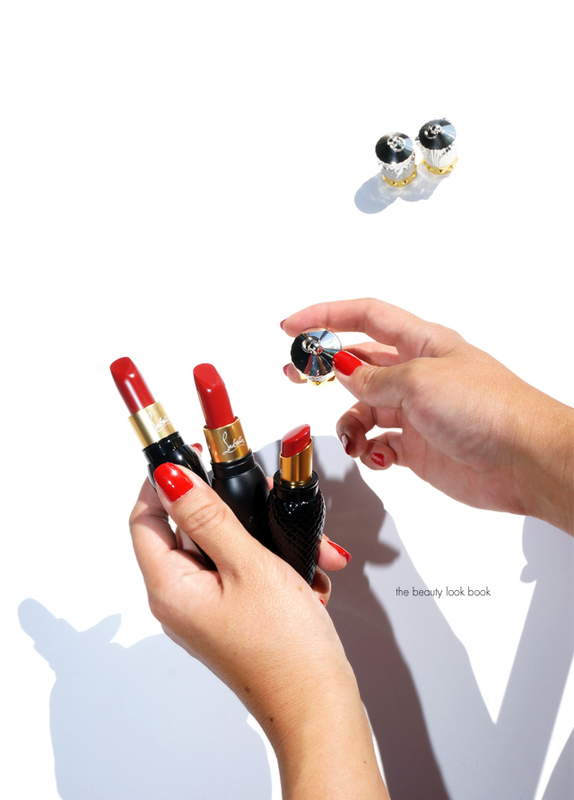 According to Louboutin these are made in the USA, paraben-ree, mineral oil-free, DEA-free and Phthalate-free. First a look at each of the three formulas and color selection. Glides on lips with an opulent and sensual feel. A unique blend of ultra-fine colour pigments expresses deep and generous colour with a silky satin finish and soft shine. Maintains an excellent appearance on lips up to 4 hours without bleeding and with durable comfort. Available in a universal shade palette, ranging from light to deep tones, across mid-tonal and bright hues of pinks to berries, reds and corals, nudes and browns. Intensely rich color goes on with full coverage and sets with a soft touch matte finish. Glides on lips with a creamy smooth nourishing sensation. Impactful colour accents lips natural radiance with a wet luminous shine. A complex of natural oils and seed butters enhances moisturization and creates a protective effect against dryness. 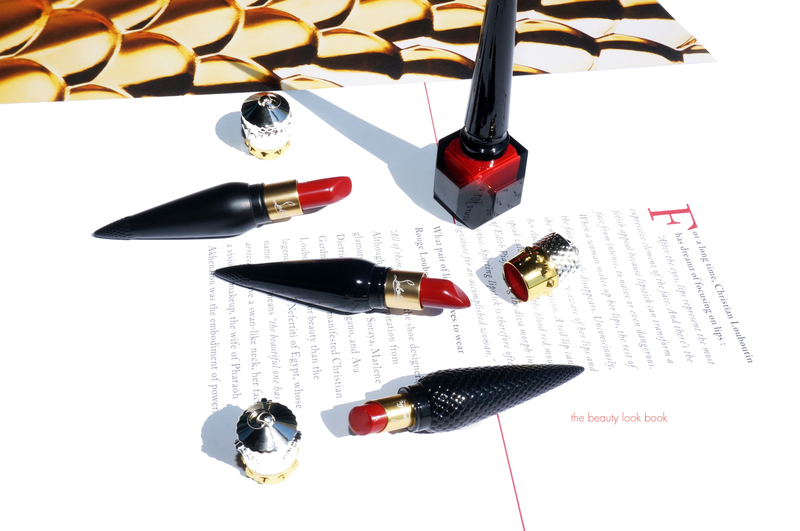 The Louboutin Beaute team was kind enough to send the three Rouge Louboutin colors. I’ve been playing with these for the last month – it was so hard to touch the actual product. They are almost too pretty to use. 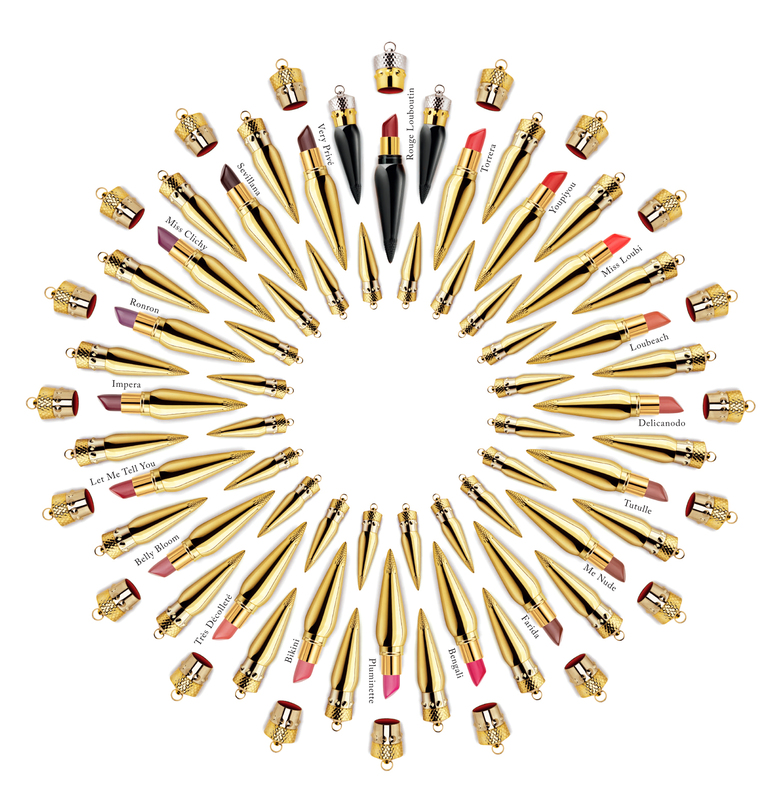 Each lipstick comes in a hefty case with a cap that has a small loop opening so it can double as a charm. 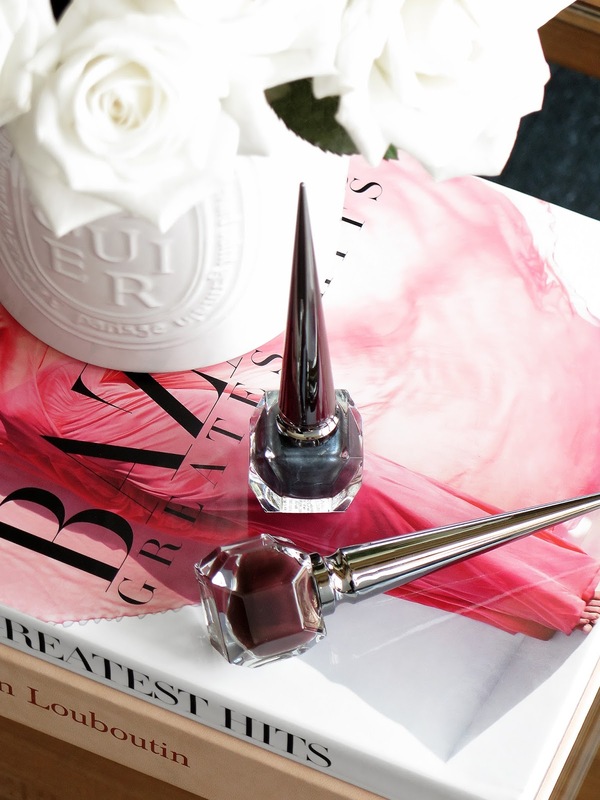 Each color comes individually packaged (search #LouboutinCharme for more photos and uploads from others). Mine came in a stunning black and red box as part of the press sample. The three formulas each have a distinct design for the packaging. The Velvet Mattes have a brushed matte finish on the case, Silky Satins have a glossy finish to the tubes, Sheer Voiles have a patterned weave to the outside. Swatches below, you can see the difference in texture. 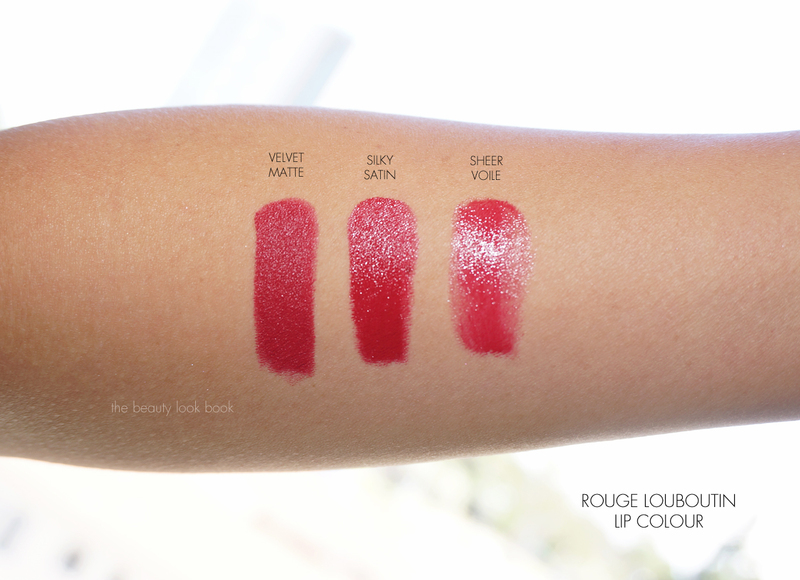 For the color in Rouge Louboutin, all three reds are very similar, if not almost identical in color. Thoughts and swatches on my lips from sheer to full coverage. First up in Sheer Voile. 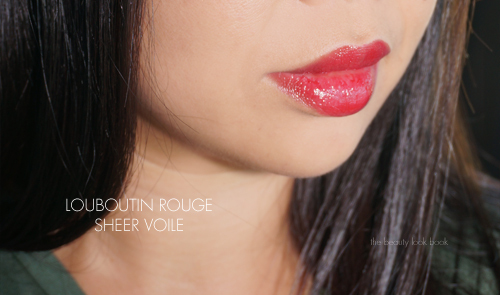 I haven’t tried or seen the other colors but the pigment of Rouge Louboutin is very very good. It has a super lush glossy finish that has a slightly transparent look. 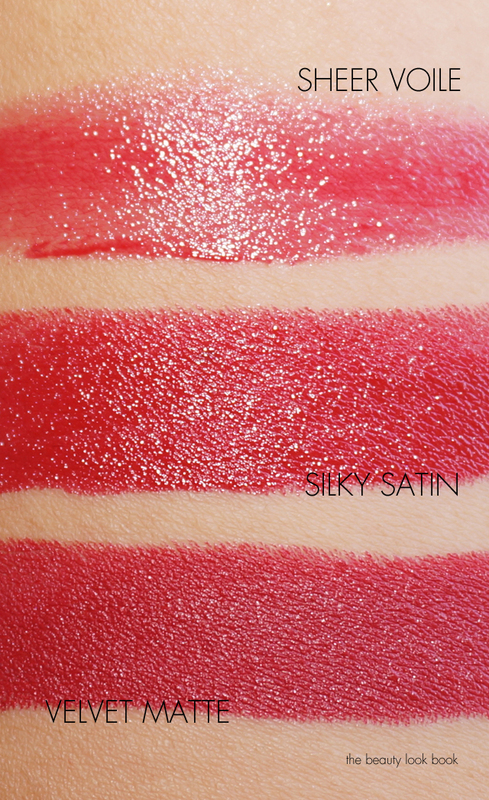 It is very pigmented on my lips and glides on like a dream. It has a very soft scent that’s hard to describe – it’s like fresh and clean with a very slight powdery touch. The scent is very subtle. I found it extremely hydrating. The product is supposed to last four hours without fading. I was able to test it for 3 hours without having it budge before I had to eat something, it stayed put relatively well through snacks and it did not bleed around the edges. For a red, this is the best sheer red I’ve tried. It’s not too cool, it’s not too warm, and it doesn’t turn fuchsia. My wallet is going to be so broke when this one is used up because I will have to repurchase it. Silky Satin is the classic formula, it comes in 20 different shades. At $90 a tube the lipstick costs an arm and a leg. I already cry everytime Tom Ford launches new lipsticks because they break the bank. I’m of the mindset that no matter how good a lipstick is, a lipstick is still just a lipstick. 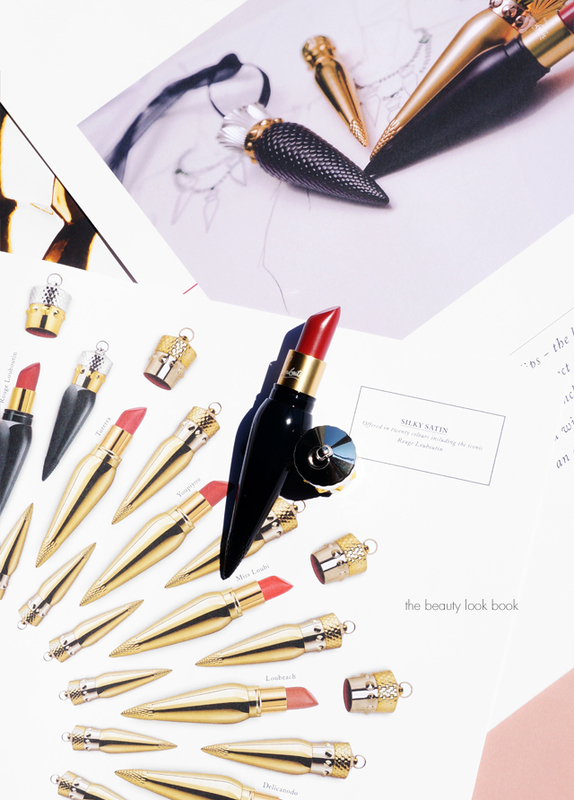 Still I will splurge on Tom Ford and after testing Louboutin I am beyond amazed that they have truly taken lipstick to another level. The Silky Satin is out of this world. It lasted a full five hours on me without bleeding, fading or budging. It did transfer to a soda can, but the color lasted through 2 Diet Dr. Pepper cans and a 4 Oreos without fading at all. The color is super hydrating and lush. 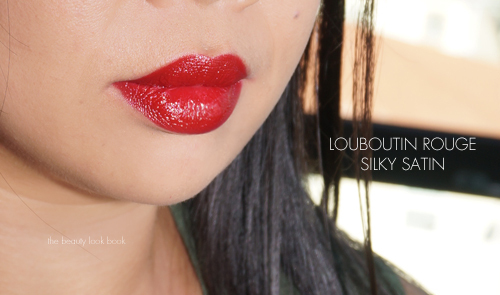 It has full opaque coverage with a very slightly glossy sheen. It makes the lips look lush because the pigment is so rich. Last but not least is Velvet Matte. I try to stay away from matte finish lipsticks because they often leave my lips looking dry and emphasize lip lines. There are few exceptions (Tom Ford Lip Color Matte is one formula I really like). 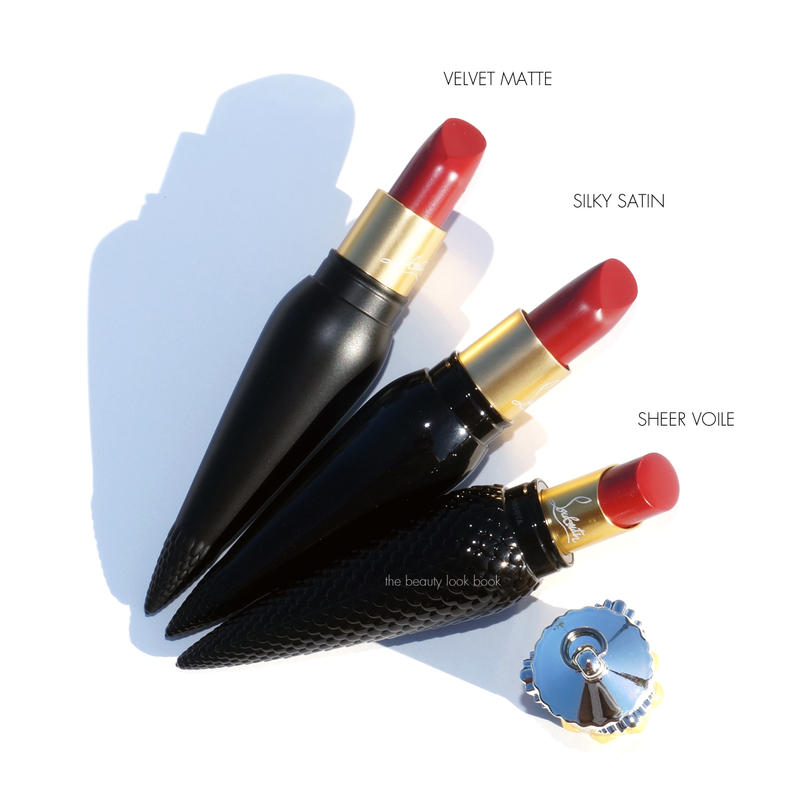 The Louboutin Rouge Velvet Matte is amazingly exceptional. It offers full opaque coverage. It does have a slightly drier texture compared to the other two formulas. It sticks to the lips and stays put without budging. As with most rich reds this requires precise application. I usually like sheers or glossy formulas because they are more forgiving – for mattes like this one if you don’t cover the entire lip evenly it shows. This one takes more care to apply, but it’s the same as with any dark or bright lip color. Even though it’s matte it’s non drying. It has a distinct matte finish but still manages to have a glow to it. After playing these for a few weeks now I am surprised to report that I am truly impressed. I still think lipstick is simply lipstick and I thought there was no way lipstick could get better than it already is. 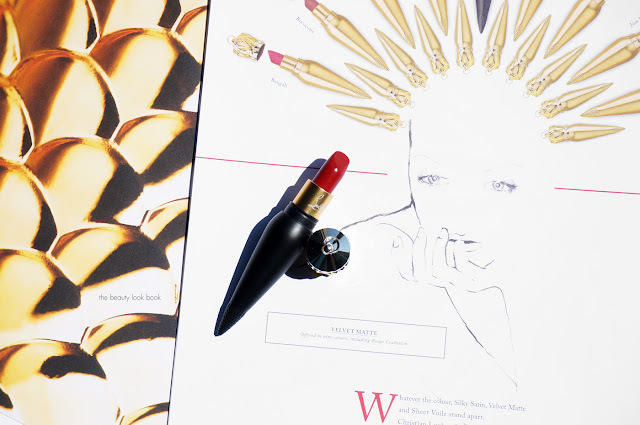 The $90 price tag is really hard to swallow, but somehow Christian Louboutin has managed to take lip colors to another level with the formula. If you can budget for one it’s totally worth splurging on. It is a luxurious item that is very nice to have. I’ve already started budgeting to splurge on a few colors I have my eye on and my wallet is crying a flood of tears right now because these will break the bank. 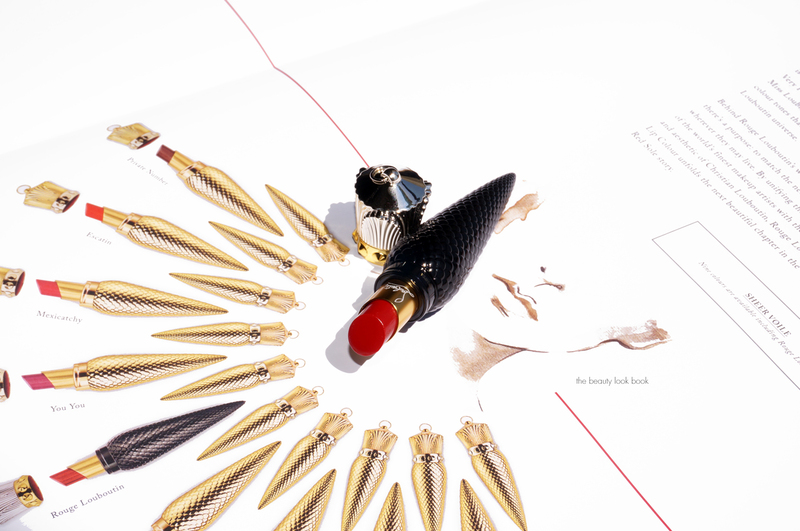 Have you checked out the Louboutin Lip Colours yet? If yes what did you think? If not yet have you ordered any yet! Let me know so I can live vicariously through you! 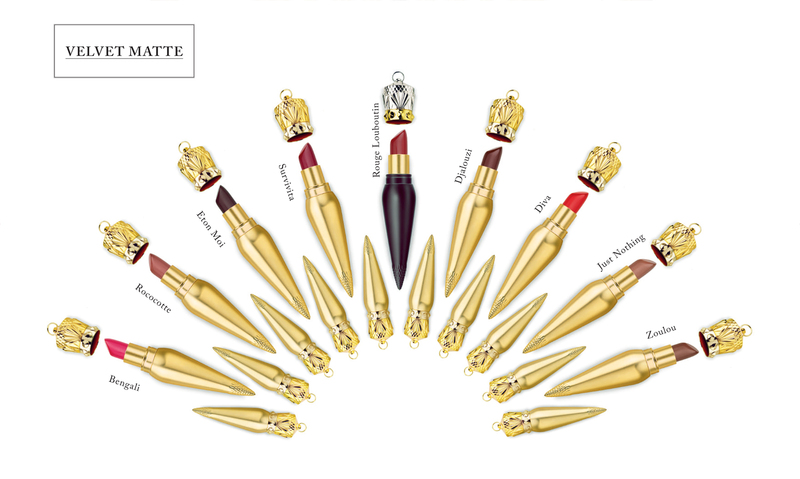 Many thanks to Louboutin for sending the Rouge Louboutin Lip Colours for review.